We open up in Central City 6 months ago in happier times for Nate and Amaya. Amaya is making chocolate covered donuts for Nate’s birthday from scratch. While touched at the gesture, Nate mentions know one make things from scratch anymore and suggests buying the donuts from the store like his mom used to do. In fact, the two make a mess of the kitchen (if you know what I mean) that the batter falls to the floor so that Nate has to go out and buy the donuts. While Nate is out, Amaya catches a news story about her granddaughter, Mari and her adventures in Detroit as the superhero Vixen. When Nate returns, Amaya and her stuff are gone. Back to the present day, Ray is showing Nate and Jax his shrink ray and how it can be used to capture and contain any anachronisms like dinosaurs so they can easily be transported back to their correct time. The Legends then take a look at the anachronism board to see there are tons and rated on a scale from 1 to 10 with one being an easy fix to 1o being the hardest. Sara wants to find an easy win and after rejecting going to the Titanic (most Martin objected to setting foot on the vessel) that the team settles on 1870 Wisconsin and the site of PT Barnum’s (Billy Zane) circus. The Legends discover the anachronism is a sabertooth tiger that Barnum has and is about to unveil publicly. But the Legends being Legends have found a way to screw things up. Instead of shrinking the sabertooth tiger, Ray accidentally enlarges it and letting it go. The simple job has jumped the anachronism level from a 1 to a 3 and Sara isn’t happy. Since the Legends don’t know how to deal with animals, Sara goes to 1942 Zambese to enlist Amaya. Sara meets Amaya at her village and meets a young girl who has found a soldier’s helmet with claw marks on it. Amaya flashes back to the time when she killed one of the soldiers. However, this turn out not to be true as Nate is not at all pleased at seeing Amaya. The rest of the team are happy to see Amaya and especially loved seeing Mick tell her that he has missed her. While Amaya isn’t happy that Sara lied to her, she still does help her track the sabertooth down and Sara manages to shrink it down to kitten size. Back at a saloon, Nate, Ray and Jax are trying to stay out of trouble while Barnum is lamenting the loss of the sabertooth tiger to the bearded lady, Hildi and his strongman. Barnum believes the loss means his circus is finish. When a bar patron rudely bumps into Hildi, a very drunk Nate jumps to her defence and picks a fight with the bar patron. Nate steels up and Barnum is impressed. Nate then spills the beans that Jax can turn to fire and Ray can shrink down in size and fly. Of course Ray and Jax tries to convince Barnum that it was the liquor talking but he doesn’t believe. 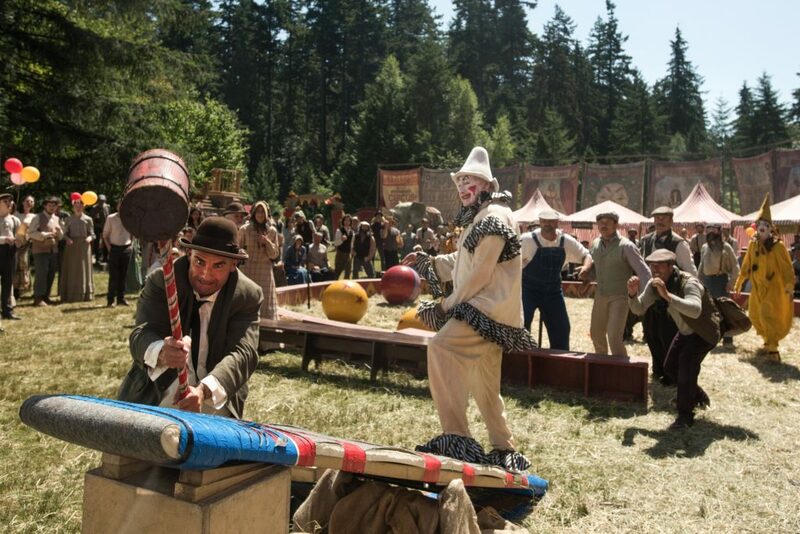 Barnum then invites Jax and Ray to see their circus which they agree while Nate agrees to talk to Amaya. However, when Ray and Jax go and see Barnum, it ends up being a trap and they are captured. A hung over Nate wakes up in the cargo hold of the Waverider and remembers what happened. So Amaya, Nate and Sara go and try and find Ray and Jax. Unfortunately, Sara notices a dark hooded figure following them and when she confronts him sees that it is Gary from the time bureau. Sara brings him back on board the Waverider where we learn the anachronism level has gone up to 6. This is thanks to 1) Mick accidentally letting the kitten sabertooth tiger out of its cage to feed it some deli meats and 2) the capture or Jax and Ray where Barnum wants them to use their powers for show. Jax and Ray say they can’t use their powers because they are missing crucial elements like Martin and his exo suit. So Barnum comes up with a better idea and that is to dress Jax and Ray as Siamese Twins. Meanwhile back on the Waverider, Sara makes Gary tell Agent Sharpe that the Legends are handling the anachronism beautifully and there is nothing to worry about. But Sharpe doesn’t believe Gary’s report and boards the Waverider. The two get into a fight and hilariously take a break to grab a drink of water. But their fight gets put on hold when the kitten sabertooth tiger unshrinks and goes after Sharpe, which Sara has to save her. But Sharpe isn’t thankful instead blurts out that she doesn’t believe Rip in thinking the Legends can help them face but we never learn what as Sharpe stops herself. While in captivity, Nate and Amaya have their talk. Amaya tells Nate what Rip told her about returning to 1942 but before she did, she traveled to Detroit to see her granddaughter in action with her own eyes. This further her resolve to go back to 1942. Nate has a better understanding at what Amaya did but still hated her for it. Amaya needed Nate to hate her so he would move on. Since Ray and Jax were a bust, Barnum needs Nate to steel up so he has a show. Nate eventually complies when Barnum threatens Amaya. Barnum continues to shoot bullets at a steeled up Nate but tires out. Amaya gets angry and unleashes the power of a bear to break out. Back at front, Martin dresses up as a clown to play on Mick’s fear of them. This is the distraction they needed and eventually Martin teams up with Jax to become Firestorm and gives the crowd a show. Amaya then chases out Barnum and is about to kill him when Nate talks her down. Back on the Waverider, it looks like the Legends fixed the anachronism and Sharpe refuses to tell Sara what the Time Bureau is up against. Amaya then tells the Legends what happened in Zambese and how she can’t go back just yet. The Legends welcome her back on the team. Sara then talks about how the Time Bureau needs their help in facing something really scary but they laugh it off considering they’ve faced Vandal Savage and Eobard Thawne. But we do see who this threat is and it is in form of Kuwasa (Tracy Ifeachor) who was summoned out of water by some sort of incantation.